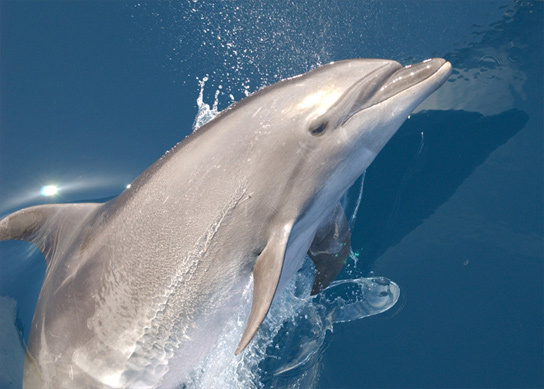 Bottlenose dolphins can understand the meaning and order of words, which can be conveyed through human hand gestures. It appears that now humans are also beginning to understand the language of dolphins as more than just a series of clicks, pulses and whistles. A new study published in the journal Proceedings of the Royal Society B shows how dolphins use their own signature whistles to introduce themselves to others when meeting at sea. Marine biologists Vincent Janik and Nicola Quick, from the Sea Mammal Research Unit at the University of St. Andrews in the United Kingdom, focused on signature whistles as a way of understanding how exactly dolphins communicated in the natural world. Dolphins are comparable to the great apes in their cognitive skills, states Janik, but all we know is what they do in the lab. The scientists wanted to understand how dolphins used their intelligence in the wild. 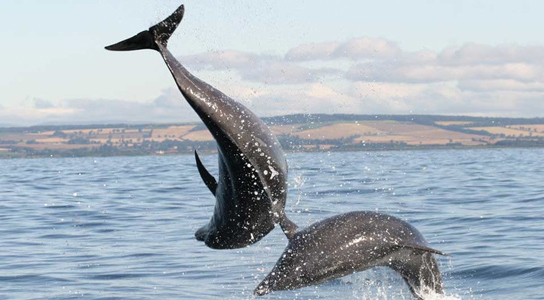 In order to do so, Quick and Janik followed a group of bottlenose dolphins, using a small vessel towing an array of hydrophones, over long distances on the eastern coast of Scotland. The hydrophones were submerged 2 meters below the surface and recorded the sounds of individual dolphins, identified by their dorsal fins. The dolphins used signature whistles when meeting another group in the sea. They also gave the distinctive whistle only when mingling with other dolphins. Only one member of each group gave the signature whistle. This could indicate that each group has a leader doing the conversing, the dolphins had previously identified themselves using echolocation and the whistle was more of a ritual, or the groups had met previously. These findings are the first of their kind, according to Laela Sayigh, a cetacean biologist at the Woods Hole Oceanographic Institution in Massachusetts. This could open up new research avenues into dolphin communication. The study also sheds some light on dolphin society. Dolphin groups are made up of individuals that live together and break up, meaning that the exchange of whistles might be the only way to manage these interactions. Be the first to comment on "Bottlenose Dolphins Use Signature Whistles to Greet Others"